One of my favorite children's book publishers is Tiger Tales Books. I think they publish a lot of cute and adorable titles that are fun to share and enjoy with little ones. If you check out the Tiger Tales website, you'll also notice how charmingly they organize their titles into various categories such as: Bound for Bed, Classic Concepts, Cuddles and Love, etc. 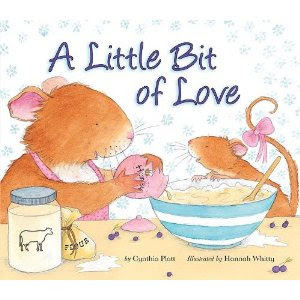 Speaking of cuddles and love, they've just released a new title in this category called A Little Bit of Love , by Cynthia Platt and illustrated by Hannah Whitty. In this story a young mouse is feeling a little hungry and so he asks his mother for a snack. She offers her baby some cheese but young mouse thinks cheese is too common place. Young mouse is thinking more of a special sort of treat and so Mama suggests that they make such a treat "with a little bit of love." Their special treat requires that they go around collecting the ingredients necessary. They begin their outing by first visiting the beehive to collect the honey that the bees have made. Mama and her young one collect honey, flour, milk and a few other things from various other people and animals. In the end, they bake a pie with all of their ingredients. Young mouse doesn't quite understand why Mama is insisting that the pie was made with a little bit of love but she explains how each person and animal made their ingredients out of love and therefore their pie is full of cuddles and affection. This is a very sweet story, not to mention quite adorable. The front cover of both the hardback copy and the paperback copy of this book is "fuzzy" so that you, er, your young reader, can feel the mice. Their fuzziness just makes them that much more irresistible! Definitely one of our favorite Spring releases! 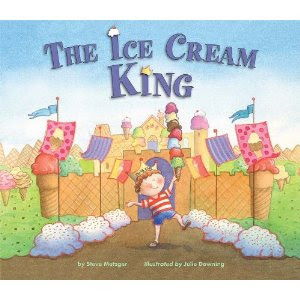 The interesting thing about The Ice Cream King are the illustrations by Julie Downing. You can get a feel from the cover art that the book is bright and colorful. However, the book opens up with more of a black and white feel to it - very light colors included that are hardly noticeable though. I was surprised to open the book and see the "dull" illustration after having admired the covered. Once Teddy starts fantasizing about the ice cream, the illustrations become very colorful. Think Wizard of Oz in the illustrator's choice of colors and layouts to help tell the story. I thought this was very clever for this particular tale. Now, of course, comes the good part. Tiger Tales has graciously offered to give away one copy of each of the above titles to one reader here. How to win? Well, hopefully by now you've figured out the drill for the day! Simply leave a comment below. This contest is open to U.S. residents only and will be open through Thursday, April 7th. * Become a "fan" on Facebook. Happy April Fool's Day! Any pranksters in your home? My daughter tried to tell me I had a spider on my head. Must have learned that one in kindergarten. Cute cover! Please include me! Posted giveaway on my Blog! Super cute! I think these would be tops on my pics for the boys right now! Sound like a great pair of books! These look like really cute books. I would love to win these for my godchildren! Thanks! My 2yo would love to own those books! These look so cute. I think my daughter would love these books. Thanks for the giveaway! These are so cute. I love kid's books. These sound right up our alley! I announced in my Friday post! These look adorable. The mouse cover reminds me of "If you give a mouse a cookie." The ice cream book would be great to read before a trip to Baskin Robbins ($.31 cones April 27, 2011, 5-10 pm). My 4.5 year old son LOVES ice cream! Both of these books are so cute!